The 4,600-square-foot Hangar and 24,000-square-foot Town Square provide a year-round focal point and a symbolic living room for the city. Located in the heart of downtown, the complex touches upon the primal notions of gathering, creating a venue for passive and active recreation while ensuring a home for nature in the rapidly growing community. The Hangar, conceived as a pavilion, is designed to morph depending upon weather or functional requirements. Simple and large, the space opens to the Town Square via a 24-foot-wide by 16-foot-tall bi-fold window wall. When open, the large roof overhang provides protection from rain and sun, and enables parents easy access to their kids playing in the adjacent 14,000-square-foot plaza. The plaza features a fountain and heated rocks to encourage people to linger in inclement weather. The inverted roof lifts up from the building to gesture toward the park and adjacent thoroughfare, with the residual gap between building and roof becoming a dramatic clerestory. At night, the extensive glazing transforms the shelter into a lantern. Inside, the structure includes a partitionable, multi-use assembly space for public gatherings, music performances, dance classes, movies, and more. Wood cabinetry lockers are integrated into the space to provide storage for community groups and activities such as yoga, club meetings, etc. The facility includes a see-through, double-sided fireplace and hearth composed of concrete, mild steel and milestone. The polished concrete floor is hydronically heated and, paired with the operable window walls and super-sized building fan, ensures a comfortable building environment throughout the year. 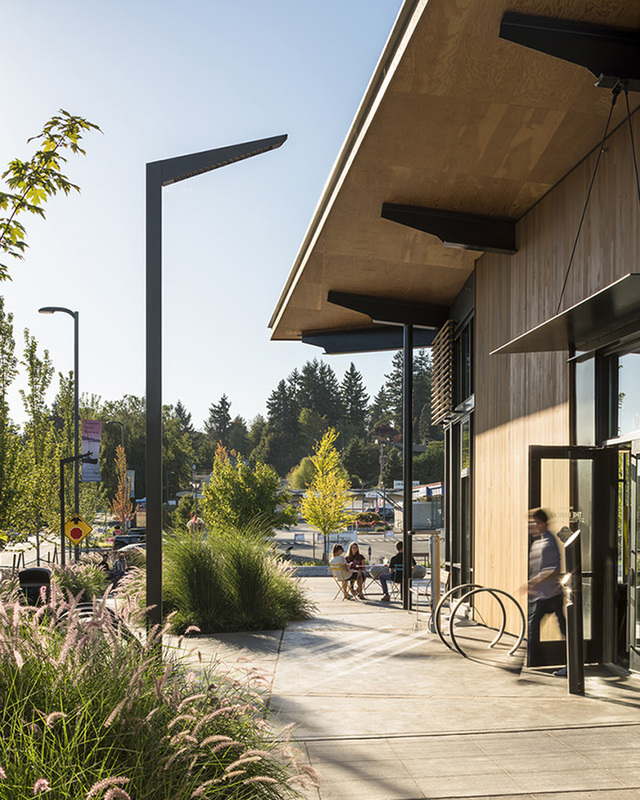 Simple, durable low-maintenance materials include exposed plywood SIP panels, steel structural beams and columns, clear cedar siding, aluminum storefront windows, and a standing seam metal roof. Provisions for a cafe and a small bakery were incorporated into the design. The Hangar at Kenmore Town Square meets the 2030 Challenge based on Total Project Energy Use Index (EUI) for when the project was designed (2015). The 2015 target was a 70% reduction in CO2 emissions to meet the 2030 challenge. This project exceeded that target by generating 79% fewer CO2 emissions than the average US building of the same type and size. The building envelope was designed to exceed the 2012 WA State Energy Code by 15%. The mechanical system reduces the use of distribution energy through use of a radiant floor heating and cooling system for the majority of the space and fan coils. Air movement for comfort is accomplished via large ceiling fans. Ventilation is accomplished with heat recovery ventilators. Heating and cooling is provided with a high efficiency VRF heat pump system.